As well as the immediate partnership organisations, there are a lot of other groups and individuals who have all contributed to this project in one way or another. Most significantly are Beate Blahy and Eberhard Henne from the Biosphere Reserve “Schorfheide – Chorin” in Brandenburg State, Germany. Both Beate and Eberhard have given many many hours of their time to help this project get off the ground and the project owes an enormous gratitude to them...and all because of their love of cranes! An thank you to you both – we are very grateful. The Biosphere Reserve team of staff and volunteers who have also put in many hours nest searching and monitoring and will be doing so over the coming years too. The farmers and landowners on the Levels and Moors - a number of whom are supporting the reintroduction through the deployment of decoys and supplementary feed, and creating suitable breeding habitats on their land. Also many thanks are due to those who will be helping the return of the cranes through sympathetic farming over the coming years. The volunteer teams in Somerset and Gloucestershire who have given and are continuing to give so many vital and useful hours to the project and help to bring the project to life in the local community. Günter Nowald - the Director of Kranich-Schutz Deutschland (Crane Protection Germany) has also given much of his time, data and advice to the project along with Wolfgang Mewes. Many many thanks to both. 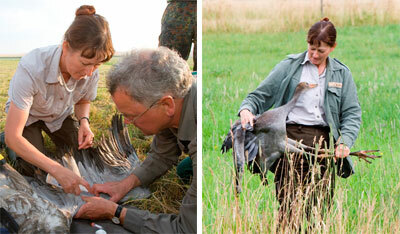 The International Crane Foundation in the USA have developed puppet and costume techniques in the captive rearing of Whooping and Sandhill cranes over the last decade. Many of the techniques that the project will be employing are based on ideas developed and perfected by ICF and the project is grateful for their assistance. You can hear George Archibald describing the early stages of this project at http://www.youtube.com/user/ICFCraneTube or visit the ICF website for more information. Scott Hereford of The Mississippi Sandhill Crane Group has also provided advice on the captive rearing and release of cranes and the project is very grateful for his help. The UK Crane Working Group, whose support is vital to the project’s success. Many thanks for accepting reintroduction as a valid and important part of the UK crane story and for all their continuing help and support. We would also like to thank all those that have supported the partner organisations within the project financially through appeals and donations – many, many thanks for your generosity. The three conservation partners, WWT, RSPB and PCT would also like to show their enormous appreciation to Viridor Credits Environmental Company for the £1.3 Million that has been given to the project for the six years 2009 - 2015. We, and the cranes can not thankyou enough!